A Great Award From Erin! My new friend Erin passed on this great award to me, I get to share it with some new friends. Please stop by Erins blog, you’ll love her. Thanks for this award! The rules that came with the award say, I need to Thank the person that presented this award to us, tell you 7 things about me that you don’t know, pass it on to 15 bloggers whom I have recently discovered and think are fantastic and notify them that they received an award. So here goes….. I love playing “catch” with a tennis ball, but it’s more like chase, cause I don’t give it back. My favorite toy is my orange octopus from Mango & Dexter. I take up so much room on my people’s bed at night they end up hugging the edges of the bed! I get along with the kitties that live here better than I sometimes let on. I eat my monthly heartworm medicine without even having to have it wrapped in anything, but sometimes it gets lost in my woozle. I’m not as trained as I should be because my mom person hasn’t spent too much time on it, but I am very well behaved. 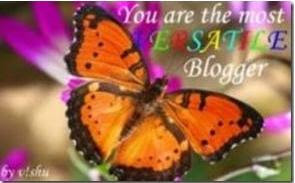 Now I get to pass this on to 15 recently discovered blogs so here goes! Miley at Curious, Cavorting Cavoodle. Wyatt at Gardening With Wyatt. Bonny & Hector at Scottishdogsblog. Mayzie & Ranger at Mayzie’s Dog Blog. Yoda & Brutus at Pugs Strike Back. Maggie May at Maggie May Says. Shiloh & Shasta at Home of Team Beagle Bratz. Samantha & Avalon at Golden Samantha & Little Sis Avalon. Luna at Little Princess Luna. Clive at Assistance Dogs For Autism. Pumpkinpuddy at Adventures of A Suburban Kitty. Bunny, Morgan, Blueberry & Lila at Houndstooth. Booker at They Call Me The Booker Man. Remington at The Life & Times of Remington. Rudy at Rudys Life As A Guide Dog In Training. If you already have this award, you don’t have to play again, but I’d love to know more about all of you. Stop by & meet these bloggers & tell ’em that Oskar sent you! I’ve been very lucky to have gotten 2 new awards this past week. The also beautiful Santa the miniature schnauzer passed on the Sunshine Award. 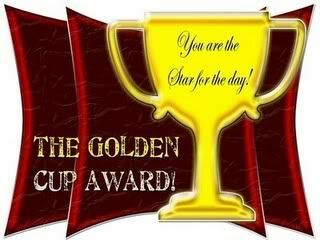 I’m supposed to pass on the Golden Cup Award to 5 friends and the Sunshine Award to 12 friends, but being a miniature schnauzer I don’t always follow the rules if I don’t feel like it. I want to pass both of these awards to all of my friends. Maybe it’s lame to do it that way, but I love way too many bloggers to pick & choose. 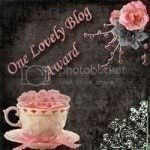 Please accept my awards with love & leave me a comment if you take it an pass it on! 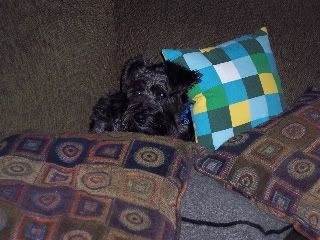 Once again this year, Oskar is waiting for them to show his picture on the Oscar awards broadcast. If you wouldn’t mind, could you just leave him a little note congratulating him on his achievements? I don’t want a repeat of last year. He got so depressed when he realized that all of those people on TV are not actually there to celebrate him. Thank you. OMG, I’m so excited I can hardly tell my mom person what to type! The Purple Hatter made me my very own Oskar Award. I can’t even believe how cool it is, take a look! Now I want ALL of you to listen to me closely. This isn’t one of those random things where I give out an award to everyone. 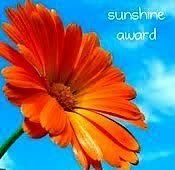 I honestly & truly want all of my friends and readers to take this award for being so loyal and awesome. Please don’t make me do another post where I have to name every single one of you. Please take this award and post it. I’m Oskar & I rock, but I only put up with friends who rock too. Give it on to any friends, dogs, cats, people, goats or whatever that are also super cool. It will mean alot to me if you post my Oskar award so that everyone knows how cool you are and that you are my friend! 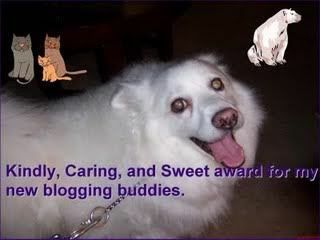 My pawsome friend Joy, from Joy To The Blog gave me an awesome blog award. This is the same Joy who sent me my fancy new pillow & a hoove thing that freaked my mom person out! I’m really happy that Joy likes me & my blog. She’s awesome & my mom person even met her in real life! 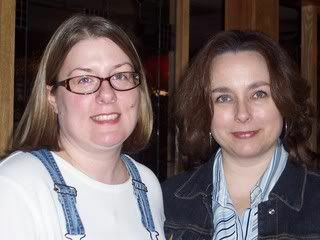 My mom person is the one in the glasses. Joy has been an awesome friend to both of us. Now I’m supposed to pass this award on to other people. I’m gonna pick some of my newest friends. Again, thanks to Joy, I’m off to nap on my cool pillow. Thank you Bruce, I feel very honored. Some of those words are very bit, but I do understand the part about being exceedingly charming! These are all great doggie blogs, so please stop by & tell them hello! 2 Awards From My 2 Favorite Schnauzer Pups! 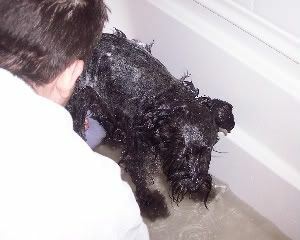 JD & Max from Schnauzer & Schnauzer are my 2 very favority bloggy pups. They’ve taught me all sorts of things about Elevenses & carrots & having tails. It’s a good thing they live across the pond or we could be a real force to be reckoned with if we all got together. 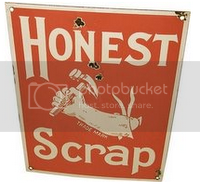 I thought I had received this because I only have a scrap of a tail. 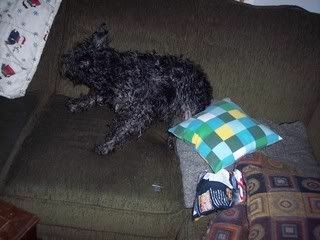 (My nubbin.) But no, I ugess they just wanted to know a little more about me. I have to tell you 10 honest things about myself. 3. My tail was docked when on the day I was born. My mom person wished they didn’t do that, but I don’t remember any pain. 4. Blogging has been super fun cause I have friends all over the world, but they don’t come here & take my food & toys. 5. I may be slightly selfish. 6. There are 2 cats here that my mom person calls “my sisters”. 8. When my hair gets long I get little curls on top of my head that my mom person can’t resist. 9. I’m very good at landscaping. 10. I’m very vocal, I voice my opinion about anything & everything. Now I’m supposed to pass this award on to 7 other bloggers who I want to know more about. 1. Bruce at Bruce’s Paws. The only cat I know that I admit to associate with. 2. Gus at This Is The Day. It’s his mom person’s blog, but I’d like to know more about Gus. 3. Oskar, Schatzi & Xena from Luv My Dachshunds. Their really cool with their German names. One of them has the best name ever! 4. Eric from A Square Dogs Blog. He’s another Brit & looks like Asta from Thin Man movies. 5. Miss Kitty Von Purr Purr from Good Mourning Glory. Her mom person is a super good friend & I want to learn more about Miss Kitty. 6. Delila from Delila’s Place. She’s a cute Boston Terrier who fights against puppy mills & animal abuse. 7. Carolina from Brinkbeest In English. She’s got horses, dogs, cats & even pigs! I want to know more about all of them. The second award that I received from JD & Max is the Pawsome Award. This award is presented to those dog bloggers out there who know the meaning of GREATNESS. 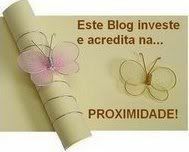 Their blogs are consistently interesting, funny, or informative. Their KINDNESS is extended to others without expectation of it’s return, and their FRIENDSHIP inspires others to do EXTRAORDINARY things. These are the blogs you can’t wait to read everyday. In short, they are AWE-INSPIRING, full of wonder, and simply PAWsome! See I told you JD & Max were Aces! 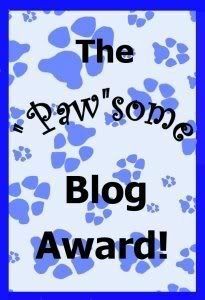 To accept this award you must paw it forward to 4 others who you feel exemplify a “Paw”some Blog, and leave a note saying why you think they deserve the Pawsome Award! 1. Hamish & his baby sister Yuna. Hamish could have had his nose out of joint with the arrival of little Yuna, but I can already tell he’s gonna be a great big brother. Plus he likes hangers & that’s just weird. 2. Carolina from Brinkbeest In English. She has 3 dogs, 5 cats, 3 horses (one is a baby), 2 pigs & some chickens. Her life is devoted to her animals & I want to hear more about those piggies! 3. Bertie & Oliver at 2 Schnauzers, 1 Blog. They’re very wise & funny. They make me laugh when I go to their blog. Plus they get special chocolate dog treats. Since I’m a rule breaker, I also pass it to Bruce the Cat. He’s not a dog, but he’s really cool and he looks great in yellow! 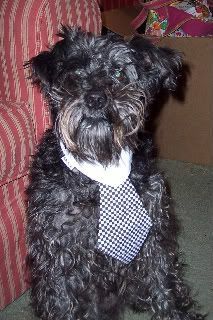 Thanks again to JD & Max for all the schnauzer love!